Great news from CVS/pharmacy and Procter & Gamble®! They’re teaming up to give you some special offers on your favorite P&G beauty products and also offering a GREAT giveaway for all my great readers! (see at the bottom of this post!). Also, from now to 4/30/13, CVS shoppers who spend $50 on P&G Beauty products will receive a $15 VISA gift card via mail-in rebate. To receive your $15 gift card, go to http://www.pgbestinbeauty.com/BOBrebate.pdf and download the rebate form, fill it out, and mail it in with your original dated sales receipt(s). Be sure to circle the P&G beauty items and purchase price(s). P&G will mail you your $15 VISA gift card in 6-8 weeks. It’s that easy! Finally, be sure to pick up your March P&G brandSAVER® in your local newspaper on Sunday, March 3, 2013 for more great deals on your favorite P&G products. Check out these great tips below to learn how to use some P&G products for beautiful hair every time! 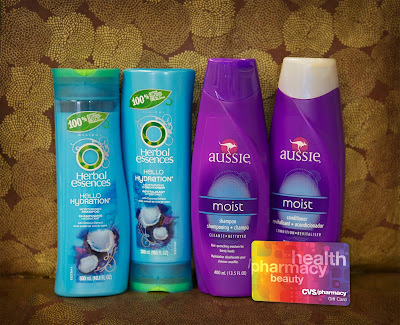 Treat hair with Aussie's Moist 3 Minute Miracle Deeeeep Conditioner and blow dry on a low heat setting. Separate hair into 2" sections and curl one at a time. After curling each section, pin the curl up for a few minutes. This will help the curl set as it cools for a longer-lasting style. Wash and condition your hair with the Herbal Essences Hello Hydration Collection. Spray Set Me Up extra hold spray gel throughout wet hair. Use a hair drier to dry your hair until damp. Pin back a 2-inch section of hair at a diagonal. Blow dry your hair completely, repeating section by section, using a paddle brush to smooth as you go. Expert tip: Angle your hair dryer away from the roots, following the brush, to keep your hair smooth. Smooth a flat iron through each section of hair.